Insights into Veterinary Endocrinology: What's the Best Protocol for ACTH Stimulation Testing in Dogs and Cats? What's the Best Protocol for ACTH Stimulation Testing in Dogs and Cats? Preparing for the ACTH stimulation test: Does the animal need to be fasted? The dog or cat does not have to be fasted overnight, and lipemia does not appear to “clinically’ affect serum cortisol values. However, having a nonlipemic sample may be better in some situations, especially if serum cholesterol or triglycerides are being measuring on same sample. Remember that the ACTH stimulation test is the most useful test for monitoring dogs being treated with trilostane (Vetoryl) or mitotane (Lysodren) see my blog entitled, Diagnosing Cushing's disease: Should the ACTH stimulation test ever be used? Both medications are fat-soluble drugs and must be given at time of meals, or the drugs will not be well absorbed. With trilostane, it’s extremely important to give the morning medication with food, and then start the ACTH stimulation test 3 to 4 hours later. Fasting these dogs on the morning in which the ACTH stimulation test is scheduled should be avoided since it invalidates the test results. When a dog ‘s food is withheld, the absorption of trilostane from the gastrointestinal tract is decreased. This leads to low circulating levels of trilostane, resulting in little to no inhibition of adrenocortical synthesis. Therefore, serum cortisol values will higher when the drug is given in a fasted state than when it is given with food. The higher basal or ACTH-stimulated cortisol results could prompt one to unnecessarily increase the daily trilostane dose. That misjudgment may lead to drug overdosage, with the sequelae of hypoadrenocorticism and adrenal necrosis in some dogs. There are many different published protocols for how to perform the ACTH stimulation testing. Both ACTH gel or synthetic ACTH can be used, but over the last 2 decades, the use of cosyntropin (Cortrosyn) has become the “gold standard” preparation for ACTH stimulation testing. 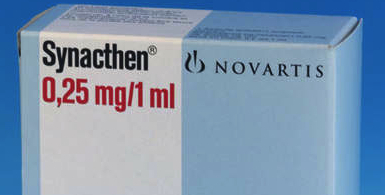 In the USA, Cortrosyn is available through Henry Schein (800-872-4346; www.henryschein.com) where it can be purchased as an individual vial ($68/vial) or a box of 10 ($720 per box or 68/vial). 1. Collect baseline serum or plasma sample for cortisol determination. Use of a serum separator tube should be acceptable for serum cortisol measurements, but check with your laboratory to ensure proper sample collection. 2. Prepare the ACTH preparation for administration (see below). Cortrosyn is supplied by the manufacturer as a lyophilized cosyntropin powder in vials containing 0.25 mg (250 µg) of ACTH to be reconstituted with sterile saline solution. In order to make this test more cost effective when using Cortrosyn and to make it easier to administer this dose to smaller dogs, I recommend diluting the Cortrosyn and dividing the solution into 25-μg to 50-μg aliquots in a tuberculin or insulin syringe, and then refrigerating or freezing the capped syringe. For specific guideline on how to dilute the Cortrosyn and store it to extend it’s shelf-life, look for may next post entitled: How to extend your supply of Cortrosyn and lower the cost of ACTH stimulation testing. 3. Administer the cosyntropin at a dosage of a 5.0 μg/kg, up to a maximum dose of 250 μg; 1 entire vial). This 5.0 μg/kg dosage will result in maximum stimulation of the adrenocortical reserve, the most important criteria for any ACTH stimulation protocol. 4. In dogs, the Cortrosyn can be administered either IV or IM, with equivalent cortisol results. Obviously, if the dog is dehydrated or in shock, the Cortrosyn must be administered intravenously. In cats, its best to administer the Cortrosyn IV, because the adrenocortical response is more consistent and the peak is higher. Given subcutaneously, the Cortrosyn is not well absorbed in cats. In addition, giving Cortrosyn by the IM route is painful for cats and should be avoided. 5. Collect post-ACTH serum sample for cortisol determination 1 hour later. 6. After the clot has retracted, centrifuge both samples. If using plasma or a serum tube without a separator, aspirate the plasma or serum and transfer into a plastic or glass vial. If you live in a part of the World other than the USA, it’s likely that you will be using tetracosactide (Synacthen) rather than Cortrosyn as the synthetic ACTH preparation. The chemical structure of tetracosactide and cosyntropin are identical, and the test protocol outlined above will work. However, because the cost of Synacthen is much less than Cortrosyn, it is common practice to administer Synacthen at the dose of a half vial (125 μg) to a cat or small dog and an entire vial (250 μg) to a larger dog, rather use the 5-ug/kg dosage. (this may be a re-resubmit. Not sure if first comment went through). Giving a larger dose of ACTH (cosyntropin) to your dog will not produce any harm. However, it will be more expensive cost you more money. Trilostane is a fat-soluble drug and must be given with food in order to be absorbed. If you fast your dog overnight and do the ACTH stimulation test the next morning after you give the medicine without food, the test will be meaningless. First of all, trilostane is a fat-soluble drug and should always be given with food to ensure that it get absorbed. The same is certainly true the morning that you are going to do ACTH stimulation testing to monitor your dog. You do NOT want to fast in that situation, because it's not going to mimic what is going on all the other days of the month(s) between monitoring periods. Secondly, a note on the frequency of administration: Once a day trilostane works well in most dogs with Cushing's disease, and that's actually the protocol we use to treat most of the dogs. However, in diabetic dogs, we need to give the trilostane twice a day to keep the diabetes better regulated. It sounds like your dog may only need 2.5 mg twice a day, but you could have a pharmacy prepare that for you. My staffordshire bull terrier was diagnosed with Cushing's in August 2013. He has been on trilostane since diagnosis, with regular ACTH stim tests. There is now a European shortage of synacthen and we've been told that any supplies left are only for emergencies and he is no longer to get the ACTH Stim test. The vet has said that baseline cortisol and electrolytes is more than adequate to monitor his dose. This is causing me huge amounts of concern as his dose had been changed from the starting dose and we now don't know how he's doing when stimmed. I'm sure the vet could apply to import an alternative (I assume cortrosyn) but they've told me there is no alternative. In your opinion, is baseline cortisol and electrolytes adequate for monitoring? I know this is a big problem, which I don't have an answer for in these cases. Monitoring basal cortisol values is fine to look for overdosage. So in your dog, stopping the trilostane and then retesting in 2-4 weeks is a good idea. Once the cortisol value goes up again (generally to >1.5-2 ug/dl or >30-40 nmol/L), the the drug can be started once again. The problem with basal cortisol valeus that that we really have no idea when we can raise the dose of the drug. Certainly, dogs that remain polydipsic and polyuric on a standard daily trilostane dosage should be changed from once daily dosing to twice daily, divided dosing. In other words, if a dog is on 60 mg once daily and remains symptomatic, this dose should always be divided and given as 30 mg twice daily before we go up on the total daily dose. I found this site information very useful... I just realize that there is no agreement among vets on treatment and how this very expensive test is done. I've been treating my little Nina with the very expensive drug Vetoryl for almost a year. I don't see any improvement in "symptoms" other than normalization of her cortisol levels. I have to mention that based on symptoms I read on line she is a very mild case. Her only issue is extreme appetite and large tummy. Nothing else. The medication didn't help reduce her increased appetite, and since starting it she has diarrhea everyday. It's been getting worse with time. She also takes Vetmedin and I read that both medications can cause diarrhea. In addition, she takes enalapril and lasix. Nobody mentioned to be the danger of mixing these medications and I found that it can be dangerous when taken together. I feel like Nina is intoxicated. Her bowel is crashing. I may even consider stopping her Cushing treatment as I sincerely don't see benefits. Her triglycerides are reaching the roof and I also believe it can be a side effect. She's been on H/D diet since diagnosed with heart problems. Any recommendation is greatly appreciated. I heard some dogs do better with lysodren. I agree with you that your dog maybe should not be on the Vetoryl, especially if there are so many other problems going on and you haven't noticed any improvmement. Talk to your vet about your concerns and about what to do. Dr. Peterson, you have experience with use of Synacthen Depot for monitoring treatment of hyperadrenocorticism in dogs? The dose may be the same or intravenous larger? Collection with two hours of application, right? Thank you. We don't have Synacthen depot in the USA. But I do know that most use a dose of 1 vial per dog (half a vial may be enough in very small dogs). A 2-hour post-Synacthen depot cortisol concentration is thought to correlate well with a 1-hour post-Cortrosyn cortisol value (the product I use). I have not ever seen or heard of such a side effect. The timing, however, would certainly indicate that the Cortrosyn (or saline used to dilute it) is responsible. Talk to your vet about possible short term steroid treatment for an allergic reaction. Also have them do a good eye exam. But I honestly do not know what the pathogenesis of your dog's signs could be. My vet always asks to fast the night before the acth stim test... so you advise against it? Only if you are monitoring trilostane therapy. If you fast and give the drug the morning of the test, the trilostane might not be absorbed on an empty stomach. Therefore, the ACTH test results you get when you give trilostane without food cannot be used to accurately gauge what the drug is doing when you do feed your dog. Sorry, I should have explained better. My min dachshund is on Trilostane, my vet always requests a complete fast (no food, meds, or water). Well, you cannot monitor the effects of trilostane therapy if you don't give the drug the morning of the text. The drug has a very short half life and will be totally gone from the circulation in 12-18 hours. My dog needs to have ACTH test done again to monitor his trilostane therapy. I give his daily trilostane around 6-7 pm with food, after I get home from work. My question is, will it be ok to give him trilostane again with food in the morning before the test? That would be like giving him recommended dosage every 12 hr instead of every 24 hr, although it would be just for that day for the test. What would be the best way to get a correct result from the test? If you are going to use once daily trilostane, it must be given in the morning if you are going to check the peak effect of the drug (3-6 hrs after administration). It makes no sense to give an extra dose on the day of testing -- then you have effectively raised the dose given for that day. If you must give the once daily trilostane at night, then test the next morning but your vet should realize that the cortisol values will be higher because the peak effect of the trilostane will be worn off. My dog was diagnosed with Cushing's one year ago. He has been on trilostane since diagnosis, with regular ACTH stim tests. When my dog started to take Trilostane, I was pregnant and I lost the baby. Since then, I´m trying to be pregnant again but it is not possible. I never touch the capsules, but I Touch the dog. could be the trilostane responsible for infertility? What can I do? and What is the effect of trilostane in person in contact with dogs that they are taking?? Bottom line is that I do not know the answer.However, I highly doubt that touching, holding or petting a dog that received trilostane could result in enough absorption of the drug to result in infertility. The worry is that this drug will inhibit progesterone secretion if you take or absorb the drug by handling it (see reference). Again, this doesn't seem possible after ingestion by a dog, but I'm not a pharmacologist! le Roux PA, Tregoning SK, Zinn PM, van der Spuy ZM (June 2002). "Inhibition of progesterone secretion with trilostane for mid-trimester termination of pregnancy: randomized controlled trials". Human reproduction (Oxford, England) 17 (6): 1483–9. Hello. We have a dog with Cushings and am wondering if there is a way to lower the cost of the ACTH Stim test...such as any assistance programs. The Vet bills are overwhelming for our family but we want to help our dog as much as we can. Any suggestions? The test just recently went up and is now $400.00. Sorry, I do not know of any assistance programs. ,my pom has had cushing for over a year. when my vet confrimed he needed treated, he wanted to give him lysodren. I read on line about side effects of both drugs (trilostane) I did not want lysodren, tried to talk my vet out of it.But had his mind made up. I changed vets and feel so bad,he had taken care of my dog for 7 years. Is trilostane better than lysodren? No best drug for all dogs. Both drugs nave pros and cons. I am fostering a shelter dog who is so very fearful that she cannot be groomed or handled by a vet without sedation. She becomes beyond stressed, combatant and bites. I have had cushingoid dogs of my own as well as fostered two rescues with cushing's so when I saw her, the symptoms and her physical appearance were very familar to me. Her symptoms are defintely not mild either. She was constantly hungry, panting, excessive dilute urine, excessive drinking, very thin coat, and very bad skin. Her behavioral problem is not conducive to doing all of the usual screening test but this is a shelter dog whose alternative was euthanasia so we're doing what we can with the information we have. A UC:CR was done with a specimen collected first thing in the morning at home. Results were greater than 100, suggestive of cushing's. She weighs 20 lbs and was started on 10 mg Vetoryl twice a day. The dog was sedated and an acth stimulation test was done at day 16. Results were pre 3.4 ug/dl and post 10.9 ug/dl. I have definitely noted improvement in symptoms so I don't feel an adjustment to dosing should be made at this time. I spoke with a representative at Dechra and asked her if sedation can skew the results of an acth stimulation test and she said she didn't think so. That wasn't very reassuring so I was hoping that you may have a more definitive answer for me. If sedation does skew results, is cortisol normally lower or higher when the dog is sedated. Any guidance you can provide in this very special case would be most appreciated. Thank you for your time. Stress will increase the basal cortisol concentration but should now affect the post-ACTH cortisol value. I apologize if I was unclear in my question. The dog had to be sedated in order to even do the stimulation test so she was knocked out completely before starting the acth stimulation test. I apologize but I don't know which sedation was used. My question is are pre and post stimulated results affected by sedation and if so, would you expect them to be lower or higher? Thank you. Basal cortisol will be increased. Post cortisol should not be affected. Trilostane being fat soluble, does the fat content of the meal given with the trilostane administration matter to its absorption? My 15-17 y/o beagle is on 40mg q.d., but he eats Purina OM (Overweight Management) Rx kibbles, which are (from what I understand) higher protein, higher fiber, and more medium-to-low in fat than most dog foods. Would it benefit the absorption of trilostane to add something to his breakfast (like, say, 1/2 tsp. of olive oil), or is "fat solubility" more of an internal process of digestion that wouldn't be effected by the lipids in the actual meal? If your dog is well controlled, I wouldn't worry about it. If not, then added a bit a fat to the food at time of drug administration wouldn't be a bad idea. I am in an awkward situation and need advise. I am in Florida for the winter and seeing a covering vet until our return home to my regular vet. I have a 7 yr old cocker diagnosed last October. We caught Cushings early and dog's only symptoms was overeating, hair and skin is normal, no overdrinking, etc. He is 32 lbs and taking 30 mg Vetoryl daily and doing great. First ACTH tests were good, pre 2.5, post 10; pre 3.3, post 8.3. Normal ranges are pre 1-5 and post 8-17. But the most recent ACTH was pre <1, post 3.4 which are both low and I am very afraid he will go Addisons and think he should be decreased to 20 mg daily, but vet wants to continue 30 mg. Covering vet told me over the phone that the pre was 1, but when I got the actual written lab report it showed <1. I spoke with my regular vet at home and told him it was 1 and he said to continue with the 30 mg, but he did not know it was lower and is on vacation this week. What do you suggest I do? A few other notes, when I got the written lab report and vet notes they were not accurate, documented notes about a discussion with me about watching for Addisons signs with the owner which never took place-I spoke with a woman there, not the owner which is a man. I do not think this practice deals with Cushings much as when I need the Vetoryl they have to order it, they do not have any in stock. If you lower the dose this week and talk to your vet when he or she returns from vacation, that isn't going to hurt anything. Your dog will have a decreased appetite or other signs of illness before Addison's develops. My vet's office (and their lab) are stating that a sample could be too lipemic for their machine to get a successful reading if not taken fasted. The fat refractiles off and the results are - not wrong - just not available. If that's true, then why doesn't every other lab provide the same recommendation? And if it's not true, then what gives? They recommend a fasted test or in lieu of that, giving the Vetoryl with a small amount of highly fatty food (like a piece of cheese). Do you have any suggestions or insight to help me understand the dilemma here? What would you do in my situation? You can't evaluate trilostane treatment if given without food. I have never fasted a dog when retested on this drug. I don't find that feeding produces significant lipidemia to influence cortisol measurement. Honestly, this is not my problem and I'm not here to get in the middle of this. If this were my own dog, I'd find another vet. Thank you. I hope I didn't offend. I was only looking for more opinions and yours seems highly respected. I do appreciate your taking the time to respond. My dog was recently diagnosed with Cushing's, started Vetoryl 20 days ago, and underwent her 1st ACTH and electrolyte testing 12 days after start of treatment. Contrary to Vetoryl manufacturing instructions, my vet does not find any benefit of performing interval ACTH testing at the 30, 60, 90 days and 3 mo. from start of treatment. He's suggesting next ACTH wouldn't be necessary for 6 months! I'm shocked and ready to get a 2nd opinion. Any thoughts? I agree. Find another vet who knows how to monitor dogs treated with this drug! My cat has been successfully treated for Cushings' now going on 5 plus years. However, now she is having problems and is declining. Her skin is very loose, her sodium continues to elevate to dangerous levels, and she is very thin. I'm concerned with how her current Internist does the ACTH stim. 1. He says she doesn't have to wait 4 hours after her Trilostane dose. 2. He only gives one blood test an hour after the ACTH med is administered. Could this be giving us false results? Or at age 17 is she just possibly winding down. Well, no research has been done to determine the best time to do an ACTH stimulation test to monitor trilostane treatment, or if the ACTH stimulation test even helps with the dosing. If your cat has Cushing's, I'd say that 5 years is a record! Unfortunately I was so focused on reading the info and risks related to my dog that I managed to miss the warning on the vetoryl information sheet regarding women not handling the medication if trying to become pregnant. I've been handling his pills for nearly a month. Now I'm afraid to try to conceive this cycle and don't know when it's safe to do so. I know for certain I am not pregnant at the moment. As long as I don't handle vetoryl from now on, am I ok to continue trying to conceive or is it recommended I wait a period of time? You need to speak to your physician about this but trilostane has a very short duration of effect so you should be fine to try to conceive now. I've just had my four year old dog diagnosed with Cushings using an ACTH stir test and a urine sptest for cortisol production. He has started on Vetoryl at a 2mg/kg SID. Can you please tell me what further tests he will need - most importantly does he need US to look at adrenal glands and/or scan of pituitary glad? I am very concerned he may have a tumour - I would wish to do everything necessary/recommended to ensure his care is the best it can be. Your advice would be very much appreciated. These days, most vets do an abdominal ultrasound to diagnose or exclude an adrenal tumor. I agree with you... I like to know if the dog has adrenal hyperplasia or adrenal tumor. It's not difficult to do the ultrasound if the operator has experience. We had to suspend my dog's Vetoryl last week because her ACTH came back very low. Do we need to test her again using ACTH or how do we know her cortisol level? I'd do another ACTH stimulation test in 2-4 weeks to see if you need to reinstate the Vetoryl. So it is not recommended to wait for symptoms to return such as excessive thirst etc? You want to monitor both labs and clinical signs. After her ACTH results tomorrow, will her cortisol be high even though she has been off Vetoryl for 2 weeks? If so should we start again or wait for symptoms to return? If the cortisol levels are high, then the drug should be started at a lower dose. She is an English Bulldog weighing 22k and will be 12 in January. Do you believe I should start her tomorrow on 30mg and have another test in 15 days? Any other recommendation is appreciated. The Vetoryl needs to be started based on these results. Talk to your vet about the correct dosage. I cannot do that online. I have had my dog scanned now, and he doesn't have an adrenal tumour. Is the next step wait and see if the symptoms fully resolve on Vetoryl, or do you think there is any merit in an MRI to see if he has an operable pituitary tumour. I'm not keen on surgery, but as a mentioned before, he is only four and if he could be "fixed" permanently it could be worth it. Do you have knowledge of this type of surgery and is it something you would advise/consider? Also, my dog is loosing pigment from around his eyes and nose - - could this be a side affect of Cushings?? Pituitary surgery might be the best, but you need a facility with experience (not many available). I'd talk to your vet about this, but if there aren't any experienced pituitary surgeons nearby, then I'd start the Vetoryl. Following on from three weeks of seeming good health on 30mg Vetoryl and all seemed well. Now, for the past week, he has returned to PUPD symptoms (making him unitary incontinent again) and the deep "panting" he suffered from before. My vet wants to do another ACTH stim and assay test, which is totally fine. She also said that he might need a BID dose of Vetoryl. Do you have any experience of a twice a day dose - and does this very short period of improvement give more of an indication of a growing pituitary tumour? I'm just very worried that my four year old dog will continue to feel very unwell during this period of testing, which I'm sure you understand. Many dogs will need (or at least do better) on twice daily treatment, and that is no way predicts that your dog has an expanding pituitary tumor. Dr, can you help me. My dog has just been diagnosed with a-typical Cushing which the vet says is good news. Does he need a stim test? He is an older rescue litter doxies approximately 10 years. I only brought him to the vet to get his nails trimmed and I got concerned when he lost half a pound. I asked the vet to run a blood test. He has no Cushing symptoms. If you think your dog is not symptomatic for anything, I would NOT recommend any further testing or treatments at this time. My 29lb neutered dog was diagnosed with Cushing's in early December and began a course of Vetoryl 10ml BID. We have steadily increased the dosage to where it is now, 20/20 daily based on Stim testing (five total). Each post test was in the range of 9 to 16; the last one, 13 was higher than the previous one, 12 even though the dose was increased by 5 ml daily. He has had two US's and a blood panel in 12/16. He also has a perianal adenoma; I'm waiting on surgery to try to get his cortisol under control. Should I pursue an MRI of his pituitary? Should we keep bumping the dose? His clinical symptoms are somewhat improved but still lots of trembling, lethargy, drinks somewhat more than he should and needs to go out in the middle of the night. Thank you for your thoughts or ideas. Make sure you are giving the drug with food. If you are, then I'd switch to Lysodren (also needs to be given with food). Talk to your vet. If you only touched the powder a couple of times, you should be okay. But please talk to you own doctor and show him the package insert for the drug. Dr. Peterson, are you familiar with the study; Pre-trilostane and three-hour post-trilostane cortisol to monitor trilostane therapy in dogs conducted by L. Macfarlane, BVMS DipECVIM-CA MRCVS1, T. Parkin, BSc, BVSc, PhD, DipECVPH, FHEA, MRCVS2 and I. Ramsey, BVSc, Phd, DSAM, FHEA, FRCVS, DipECVIM-CA3? The results of this study indicate that this monitoring method shows that the pre-trilostane and three-hour post-trilostane cortisol concentrations were better than the post-ACTH cortisol concentrations at discriminating between dogs with excellent control and those that were undercontrolled. Do you see this as a possible futyure choice to monitor Vetoryl treatment using a simple pre-pill cortisol rather than having to go through the hassle and expense of an ACTH stim test? Yes, I know the work well and I do think this approach has great promise. Certainly makes more sense thank the ACTH stimulation test! Thank you Dr. Peterson! I have been moderating canine cushing's support groups for 12 years and there is absolutely no doubt that if this approach becomes established protocol, it can make a huge difference for many pet owners who are financially unable to treat their dogs and afford the acth stimulation tests. I think this could be the best thing since sliced bread. :) You are a trusted expert by many of us who often use this amazing site to educate our members and help them become better advocates for their dogs. You've been my personal go to with questions over the years and you have no idea how many dogs have benefited from your Q & A pages and your personal answers to me and others. It is not uncommon for members to educate their general practice vets, using pages out of your site, so you've also helped provide free continuing education for many, many vets over the years as well. I think I speak for scores of us who are dedicated to helping pet owners and their dogs when I say thank you from the bottom of my heart for being so gracious with your time and knowledge. You rock the canine cushing's world!